Club USA Fitness offers 110 Group Fitness Training classes weekly, 45 classes held in our state of the art, 3200 square foot Aerobic Studio! Club USA Fitness has incorporated the TRX SYSTEM into many of their classes in the Aerobic Studio! This revolutionary workout makes use of a simple strap with handles whose suspension design uses body weight and the laws of physics to create hundreds of exercise progressions with virtually unlimited levels of resistance. The TRX program includes highly functional exercises that will challenge your core, develop lean and powerful muscles, leaving you with increased energy and vitality. TRX may be used in varies classes which will include aerobic training, such as our Sport Boot Camp, Combat Boot Camp H.I.I.T. (High-Intensity Interval training) and our Newest PX3 classes. To learn more about our aerobic studio, contact us at membership@clubusa.net. Aerobics classes near you? Yes, all RIGHT HERE at Club USA in Littleton, Group Fitness aerobic training classes! Aerobic training classes offered for your cardiovascular benefit are available daily including Cycling, Zumba H.I.I.T. and Boot Camp classes all held in our beautiful spacious Aerobic Studio. Our Cycle classes run from Sunrise cycle through Happy Hour cycle creating a fun and accessible experience for riders of all ages and fitness levels. We fuel each ride with amazing music and Lighting to create an exhilarating experience that goes far beyond a great cardio aerobic training workout. Want to dance for aerobic exercise? Cardio Dance, Zumba, and Refit maybe the Fit for you! REFIT® is a fitness community, creating a fitness experience that changes people from the inside out, and this vision is accomplished by focusing on the heart as a muscle and soul. This workout is for everybody regardless of age shape, size or ability. You will achieve a great aerobic training benefit as well! REFIT® creates a powerful, uplifting fitness experience that lasts well beyond the workout. Are you ready to join the revolution? Zumba® Ditch the Workout Join the Party, aerobic classes Latin Style. 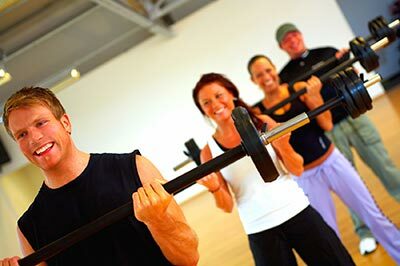 In addition to your Aerobics Classes, we offer classes of Pure Muscle Pump classes in our Aerobic Studio. Using light to moderate weights on a barbell along with free weights, performing several repetitions, Pure Muscle gives you a total body workout! This Barbell / Free weight workout Pure Muscle is for anyone looking to get lean, toned, and fit…FAST! Looking for “Aerobics classes near me?”, specifically designed for seniors? We offer Silver Sneakers. Silver Sneakers is an exercise program in our Aerobic Studio specifically designed for older adults with the goal of keeping you engaged and interested through fun and social activities. Enjoyable fitness activities may encourage older adults to stay healthier overall. For more information about our classes or our gym facility in Littleton, fill out the form below and a support staff member will reach out to you shortly.